Growing up in the middle-class suburbs of Arizona is a world away from the inner city of Kansas City. It is a culture of wannabe Californians, hipsters, long boards, tan skin and the stereotype that pools are in every backyard. After graduation I was blessed with the opportunity to go out of state to Kansas State University and Manhattan Christian College, where I majored in Public Relations, and Bible & Leadership; but God’s blessings didn’t stop there. 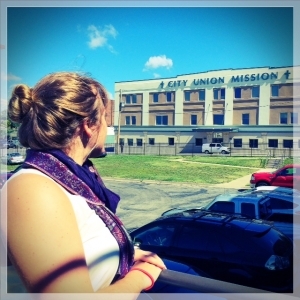 I then was given the chance to intern in the Development Department for City Union Mission. I always knew what homelessness was, it was sad and the pictures were hard to look at, but it was never real for me. Don’t get me wrong there is plenty of homelessness in Arizona, but from the front porch of my suburbs that wasn’t my view. Then came my epiphany… now interning at the Mission I see homelessness for what it is, I see it firsthand. It’s no longer something that I’ve heard people go through, a problem for people in low-income areas or an intense photo taken in black and white to illicit more of the water works. Homelessness is REAL. It’s devastating and tragic and a mix of emotions that can’t always be expressed. But there is another side to it, a side that has a little more light, a side where God shines through. I hear stories about clients who graduate from the Mission’s New Life Program or Christian Life Program and go on to succeed in life. They are able to provide for themselves and their families, and they make a mark on this world that will stand the test of time. I may not be working with the Mission’s clients face-to-face, but I know that the work I am doing behind the scenes here plays a role. I see my work as the middle man between the clients and the donors who help keep this Mission running. I have the privilege of co-hosting the blog for the Mission and I get to hear all of the wonderful stories and see all of the bring-a-smile-to-your-face pictures that are posted for our followers to see. I have learned a lot being here at the Mission, and so far the greatest thing I can take from this internship is the enlightenment God has brought me of the reality of homelessness and love. Grace and hardship. God and His people.